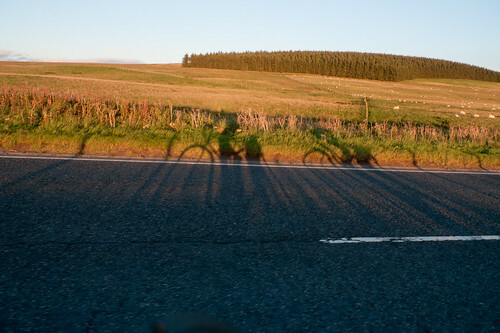 In September, F and I cycled from Land’s End to John O’Groats, from tip to tip of the UK. And I’ve been trying to write about it ever since. It felt like something I should write about. I think one of the reasons why I’ve found it hard to find the words is that it seems so far removed from everything that happened before and after. There’s no narrative that leads in and out of the story. We said we’d do it, we planned it a bit, and then one day we got a train down to Cornwall and disappeared into a bubble for three weeks. It didn’t seem particularly real to me, looking east from Land’s End in the lashing rain, thinking that we would now cycle to the other end of the country, and that I shouldn’t freak out about this. I almost did. And it didn’t seem particularly real to me when we arrived in John O’Groats, with the light failing. As I looked out over the North Sea I could only wonder if there was anywhere else left to go. There wasn’t; we’d done all 987 miles. That didn’t seem right. Then, the other day I watched this video by the director Seamus Murphy, for PJ Harvey. The short vignettes of British life reminded me of the things we spotted from our saddles. The detail and closeness of the footage reminded me of glancing through people’s front windows, listening to their chatter and watching their fields. It reminded me of rolling through towns and villages as close, passive, and silent observers of British life. It’s a good song, I think, and I watched the video all the way through, before I realised what it was I felt looking out over the North Sea, shortly before we found the whisky. I was proud, yes; proud we didn’t give up; proud we kept each other going. But also something I’ve never really felt before: I was proud of this country. And I think that’s something not many British people ever really let themselves feel.